Mrs. Heather Kippin, Chris Kippin, Ted Colley and Mrs Mary Beresford enjoying a pre-dinner sherry at the Winchester and Portsmouth D.G. dinner on May 1. Chris and Ted were two of the speakers during the after proceedings. 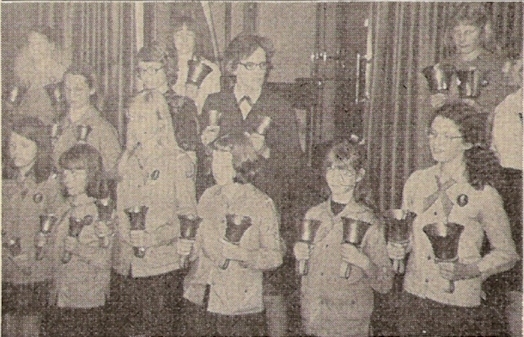 The handbell entertainment at the Winchester Dinner (p. 444) was given by some of the 4th Christchurch Guide Company, seen here preparing for the first of the selections which were played admirably. When the organizers of the Winchester and Portsmouth Diocesan Guild's 8th annual dinner chose May 1 at the Royal Hotel, Southampton, for the event, they had no idea that Southampton City would be in the F.A. final, let alone win the cup. However, the 140 or so who attended the dinner were certainly made aware of it, for the celebrations continued at short intervals during the evening and well into the early hours of Sunday: cheering, shouting, singing, car horns and hooters blasting everywhere. Even one speaker at the dinner suddenly brought out a rosette and pinned it on his lapel - Southampton of course! As has now come to be expected, there was a complete sell-out of tickets for the dinner, and the high standard of organisation - the meal, the service and speeches, as well as the kindly and friendly company - were all once again very much in evidence. Because he was delayed by official duties at a ceremony in Winchester Cathedral, where his presence was essential, the president, the Lord Bishop of Winchester (Rt. Rev. John V. Taylor), and his wife, were late in arriving, and the Master (Mr. Roger Savory) decided after a period of waiting to start the formal proceedings. The rector of Southampton (Canon R. J. Milner) said grace, and during the first course the Bishop and Mrs. Taylor arrived, to be welcomed by the Master and Mrs. Savory. Following the meal, the loyal toast was followed by a short interlude and then the president called upon Mr. Denis Beresford (Master, Society of Royal Cumberland Youths) to propose "The Guild". In more sober vein he said it was a privilege to propose the toast to such a dynamic and active Guild. Involvement in such matters as bell restorations and redundant bells, and in many similar matters, placed increasing demands on their organisation and on the officers in years to come. The Winchester and Portsmouth Guild, he added, appeared particularly well placed in dealing with diocesan organisations in matters connected with secularisation of rings and in supporting bell restoration funds. In the past the Guild had been wall served by many of its members, several having now been made hon. life members, viz. : Messrs. Charles Bassett, Dan Matkin, Ted Collins, Arthur Davis and Les Whitfield, whilst there was also a wealth of talent among the younger members. The report in The Ringing World of their A.G.M. told of the quality of ringing, their outstanding success and the tremendous activity within the Guild, and he congratulated the officers and leaders. The programme emerging for the centenary celebrations showed lively and enthusiastic enterprise, which augured well for the continuing high quality performances which iiad been set for them and inherited from the past. "To the major problems which will come of redundant bells, unringable bells, sound control and teaching, I look forward to an example of dealing with them by the lively Guild whose toast it is my pleasure now to propose," concluded Mr. Beresford, and the company rose enthusiastically to honour the toast. The president, the Lord Bishop of Winchester, Rt. Rev. 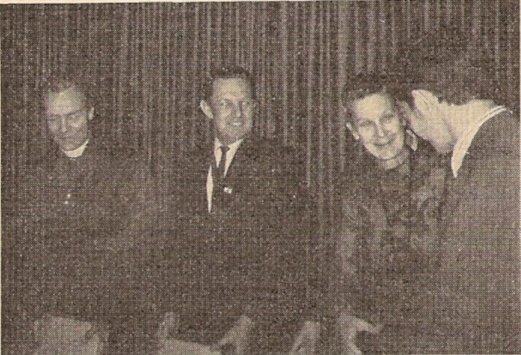 J. V. Taylor, the master, Roger Savory, Mrs. Taylor and Mr. Chas. Kippin. The president and his lady were delayed and arrived after the meal had started; nevertheless. they received a warm welcome from all present. Responding, Mr. Kenneth S. B. Croft (guild treasurer) said: "Like ourselves, the Society of Royal Cumberland Youths, of which Denis is beyond question a highly-esteemed and popular Master, is enjoying, in the seventies, what is generally regarded in change-ringing circles as 'success'. I have not infrequently pondered just what it is that makes any organisation tick, as we say. "I hold the view," he continued; "that one of the measures by which success can be judged lies in the answer to the question 'To what extent is good fellowship being engendered?' Each year, this dinner provides a fine example of our fellowship: easy, of course! we are here to enjoy our cakes and ale; our very flourishing Bell Restoration Fund provides another: the coming-together for social events has surprised many of us into the realisation that there are things of far more estimable account than the mere increase of funds. "The development of a fellowship means people meeting people. We transact much business at our various meetings - because much happens in the W. & P. - yet it would be idle to pretend that acrimony never rears its head or that blind prejudice never lurks close by. I would suggest," added the speaker, "that the strength of our Guild lies not in the fact that these things never occur, but that there exists sufficient good will and tolerance to contain them if they do. The hon. 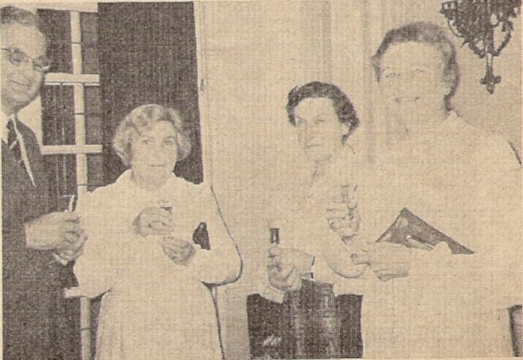 treasurer, Kenneth S. B. Croft, with Mrs. R. J. Milner, wife of the rector of Southampton, Mrs. Edna Denyer and Mrs. Madeline Croft. 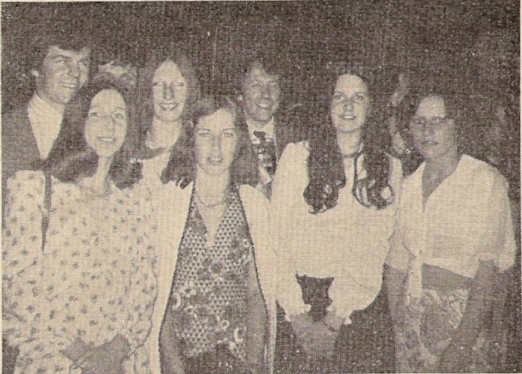 A group of young people enjoying themselves before the dinner: back (l. to r.) Graham Nabb, John Colliss, Pip Menniss, Ian McCallion; front - Christine McCallion, Ann Bennett, Linda Varley and Sandra France. "Denis," concluded Mr. Croft, "we thank you for proposing the toast and we ask you to convey to the Society of Royal Cumberland Youths, at their next meeting, the sincere good wishes of all in the Winchester and Portsmouth Guild." Mr. Chris Kippin, who was to respond to the toast, was also greeted, a particular reference to graffiti on a wall in Winchester which read "Kippin is past it!" causing much amusement. He was to come again later in the year to judge the Guild's striking competition. The R.W. editor, who takes more "stick" than any other member of the Exercise, was welcomed and thanked for his work for, said Mr. Colley, without a Ringing World bellringing would not and could not be the same. Other guests and visitors were greeted, Mr. Colley concluding by stating: "It is an indication of the standing of a Guild when visitors from other Guilds take an interest and attend functions such as this. We are grateful to them for the compliment they pay us in being here, and also those non-ringing visitors whose patience at times is quite remarkable." Referred to on the toast list as an "Old Boy", Mr. Chris Kippin said that on the first occasion that he had responded to a toast, the lady who was to propose it collapsed twice before saying no more than "ladies and gentlemen". The next occasion, also proposed by a lady, resulted in that lady eventually becoming his wife. [Applause.] He thanked Ted Colley for his welcome to the visitors and wished him well in his new home in Lincolnshire. He (the speaker) did not know whether he was really a visitor as he remembered clearly his early youth in the area, and he thought he must have listened to at least 800 of Canon Felstead's sermons [laughter]. Referring to the cup final, the result of which could still be heard outside, Chris said now it was all over, no doubt they would be singing "For all the Saints, who from their labours rest!" He had heard that one officer of the W. & P. had a problem: he had bought a dinner ticket - and also got one for Wembley. He added: "I can't see him in this company here, so …" [laughter]. He concluded by thanking once again the Master, officers and members of the Guild for their hospitality. The Bishop, who introduced each of the speakers, said that the ringers should not be too put out by the loss of bells, which were likely to be used in a secular rather than spiritual sense. It was not only the Church that gave praise to God, but this also appertained to a greater or lesser degree in many secular activities and buildings. They could offer worship to God in everyday life as well as in church and on Sundays. Winding up the formal proceedings, the Master expressed appreciation to those who had helped him in any way, particularly mentioning the 4th Christchurch Guide company and their captain (Miss Jillian Aslett) who had entertained with handbell selections during an interlude, Mr. Arthur V. Davis who had trained and led them, and Mrs. Gilian Davis who had introduced the items. The bar, open until 11.30, was well patronised and the high spirits with which the evening commenced were still very much in evidence for the remainder of the event. It was certainly a highlight, socially, of the ringing calendar. The Bishop of Winchester had, on the previous day, presented a football cup, given by Radio Solent to the winners, Christchurch Scout Group, and he was particularly pleased to welcome their counterpart, the 4th Christchurch Guide Company, at the dinner. Among the officers and guests at the principal table were the Master and Mrs. Roger Savory, the Lord Bishop and Mrs. J. V. Taylor, Mr. and Mrs. Denis Beresford, Mr. Edward Colley, Mr. and Mrs. Chris Kippin, Canon and Mrs. K. W. H. Felstead, Canon and Mrs. R. J. Milner, Mr. and Mrs. Kennett, Mr. and Mrs. K. S. B. Croft and Mr. Barry Fry (gen. sec.) and Miss Jane Boyle. The Bishop was making his first appearance as president of the W. and P. D.G. and he was wearing his seal of office as Prelate of the Order of the Garter. 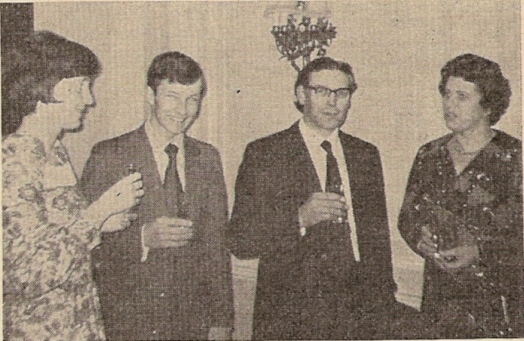 One of the organisers of the dinner, Derek Jackson, could not attend as he was supervising a Scout Group tour in the Midlands. At one point when the Cup Final revellers were returning home and there was an interlude in the proceedings, Canon Milner and the Bishop stood on the balcony of the hotel waving to the Southampton supporters, a gesture no doubt much appreciated by all. Whilst serving in Africa the Bishop was thought to be a rain-maker, as on a number of his visits to places where there had been no rain for perhaps six months, on his arrival the rain started. It could have been a coincidence that as he was telling the company this, the rain, absent for so long, was pouring down outside in Southampton! Where in the whole wide world could anyone wish to be tonight but in Southampton, said the Bishop as he rose to address the large company! Applause and cheers greeted this comment, joining in the hooting and singing which was going on out in the town.